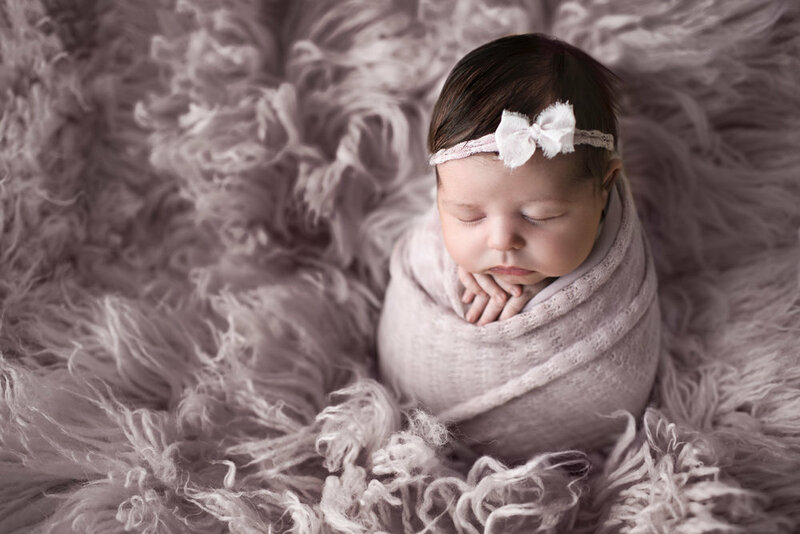 This in-home newborn studio session took place in Danbury, CT, in their living room. Along with bringing my studio lighting, I supplied all of the wraps, headbands, and other props. All mom and dad had to do was supply the space - I don’t need much more than 5 square feet - and of course the baby! Beautiful 12-days new Madelyne with her gorgeous head of hair. Since she was still awake once I finished setting everything up, I decided to start with family images. Awake newborns really just want to be held! This first image in dad’s hands is currently my favorite pose of baby and daddy. It really captures how small they are and gives a sense of protection and love. And I absolutely love the strong eye contact by Madelyne in this image! She wasn’t super happy posing her birthday suit, so we wrapped her and gave her to mama and she quickly drifted off to sleep. A sleeping newborn = a baby that will let us pose her! We lucked out with her easy temperament and were able to capture a few different sets before she awoke. We are lucky to be capturing this little one’s first year with our Baby Plan - make sure to check back for her three month session soon! And, if you’d like to see more newborn images, head on over the Newborn Gallery!